The weather forecast doesn't look very good for today and those pesky winds, admittedly light, are blowing from the wrong direction. I start the day back in stinky Newquay next to the war memorial by the Atlantic Hotel. It is a properly murky start to the day. It's a late start for me today as the tide is in so I will need to take the ferry over the River Gannel and the ferry doesn't start until 10am. 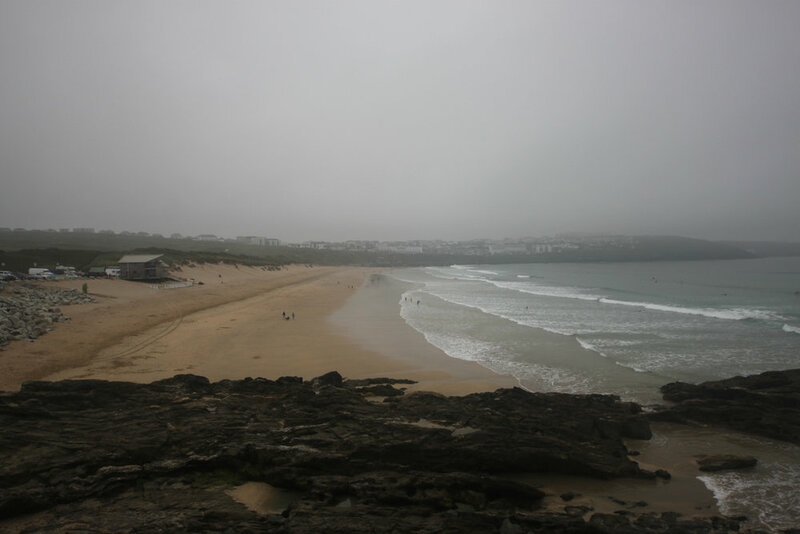 I round Towan Head and I now have magnificent, if rather murky, views over Fistral Beach. I drop down on to the beach and trudge my way along the golden sand. There are many surfers enjoying one of the finest surfing beaches around. There's not much wind though so the surf is rather pathetic. At the far end of the beach I join the Esplanade where I pass the Fistral Beach Hotel (@FistralBeachH), exclusively for adults. What have they got against kids? I walk along Pentire Point East, double back on myself and then walk through the car park here. I turn down Riverside Crescent following a sign which points down towards the Fern Pit Cafe and Ferry (@fernpitcafe). As I get to the cafe a church bell chimes 10. Perfect timing! I wait around for another 10 minutes before the cafe opens. Good job I'm not in a hurry. I climb down the zig-zag steps to reach the ferry boathouse on the bank of the River Gannel. I climb aboard the ferry and we putter across the river to reach Crantock Beach. The fare is £1.20. The path through the dunes can be a bit fiddly so I head out on to the beach instead to enjoy the fine, golden sand. I head across the beach below the Bowgie Inn, surely one of the best placed pubs ever, and perfect for thirsty walkers wanting a pint with a fine view. The tide is a long way in so I exit the beach through the dune system to rejoin the coast path and continue on grassy slopes around Pentire Point West. It's pretty murky now and has started to drizzle. I drop down to reach the beautiful and secluded beach at Porth Joke, sometimes known as Polly Joke. I had no idea why so I had to look it up. The name Polly Joke is thought to be derived from the Corhish Pol-Lejouack meaning Jackdaw Cove. Makes sense now as there are an awful lot of jackdaws about. Despite its seclusion there are quite a few people either on the beach or heading to the beach. I head down to the sea before heading back up the beach to cross a footbridge over the stream here and climb onto the grassy Kelsey Head. I round Kelsey Head and have beautiful, but very murky views over Holywell Bay which ranks right up there with Constantine Bay. The coast path ambles gently downhill to the sand dunes and a boardwalk and steps take me down to the beach. And what a beautiful beach it is. The last time I was here it was blowing a gale and I couldn't get on to the beach but today conditions are much calmer if wet and grey and I amble along the beach. It's still pretty windy though. Whatever happened to the forecast for light breezes? Holywell is a tiny place but is served by two pubs, the Treguth Inn (@thetreguthinn) and St Pirans Inn. I head back into the dune system where a footbridge takes me over the river. 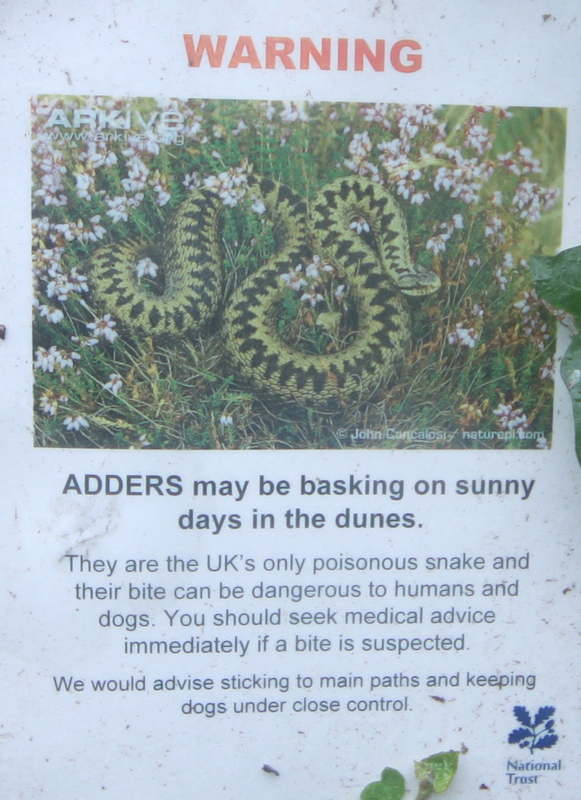 A sign warns me that adders may be basking on sunny days but there's no chance of that today. 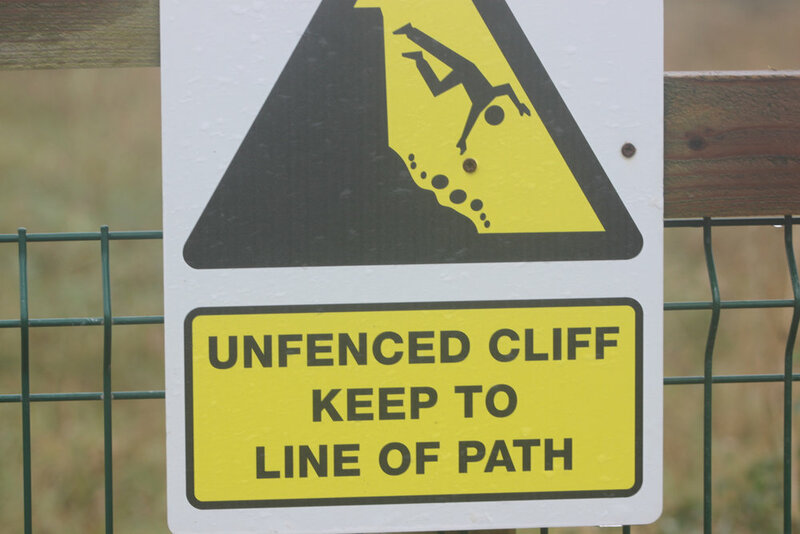 A now overgrown big, red sign warns me about the dangers of entering Penhale Army Training Area. Odd because Penhale Camp was closed by the Ministry of Defence in April 2010 and partially sold off in September of the same year. I round Penhale Point, taking one last glance back over Holywell. 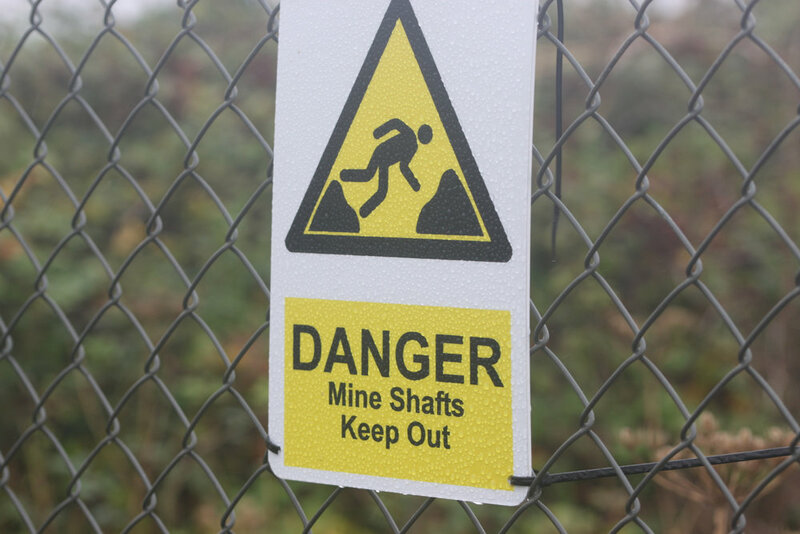 I avoid the mine shafts and the leftover army junk and continue along the cliffs above Hobblyn's Cove. Penhale Camp is now the home to the Penhale Military Adventure Training Centre and offers a broad range of military adventurous training. I round Ligger Point and have magnificent, but very, very, murky views along Perran Bay. I can't make out anything ahead so I've no idea whether I can make it all the way along the beach to Perranporth. I know there's an exit point about a mile down the beach but I can't make this out in the murk. I'll just have to take my chances and hope that I don't have to retrace my steps. 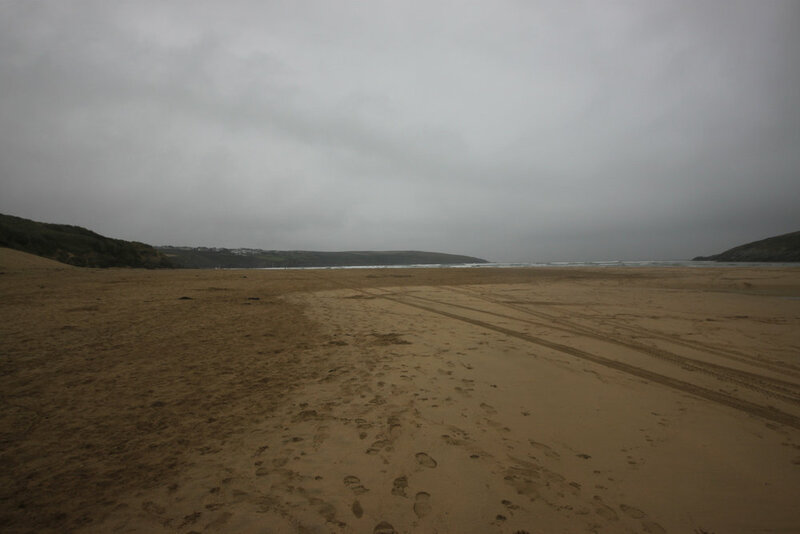 I wander down the path to reach Perran Beach and I now hopefully have at least a one mile trudge along fine, golden sands before clambering back onto the sand dunes to reach Perranporth. 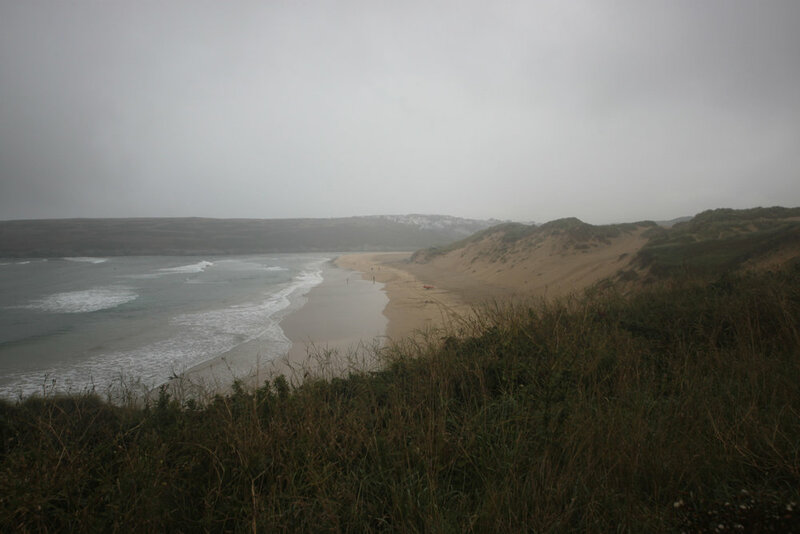 Behind the beach is Penhale Sands, the most extensive system of sand dunes in Cornwall. About a mile down the beach I come to the exit point next to the lifeguard station but it looks like I can continue along the beach all the way to Perranporth so I do. There's one section where the sea almost reaches the cliffs but I can get through quite easily so I continue along the beach to reach Perranporth. It is looking rather murky. And that's the end of the walk. A short and sweet walk today if rather grey, murky and damp. It was a rather murky day for looking out for flora and fauna! According to my phone I've walked 12.6 miles today which amounts to 27921 steps. 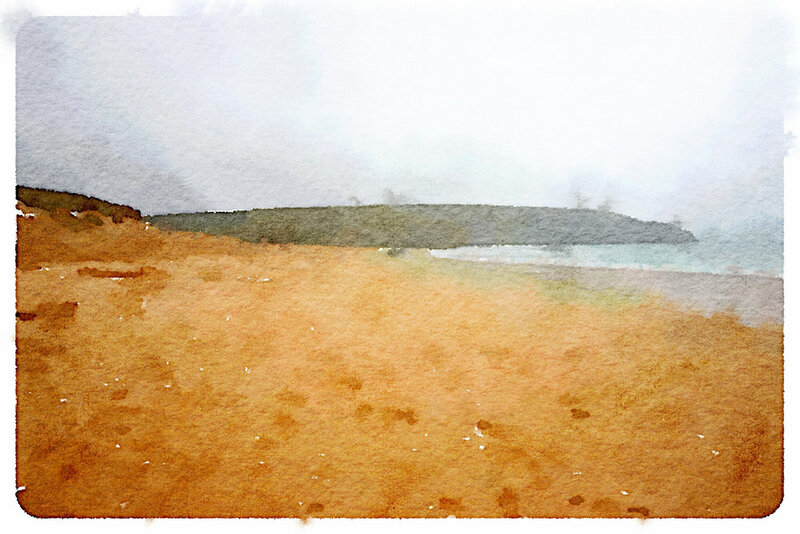 It has been a murky and damp day today and my shoes are coated in sand from the various beaches. A pleasant walk nonetheless along a lovely stretch of the coast. Eight out of ten! My Ordnance Survey app has worked for the first time this week but I'm not convinced that it's correct. My other elevation chart is far from perfect but I suspect the gps chip is giving occasional false readings.